I recently returned from what I would have to call a very improbable journey. When I first dipped my toes into the fast-moving stream of social media, it was reluctantly and with great trepidation. What if everyone out there is a complete weirdo? What if no one reads my blog? What if they think I’m a complete weirdo??? 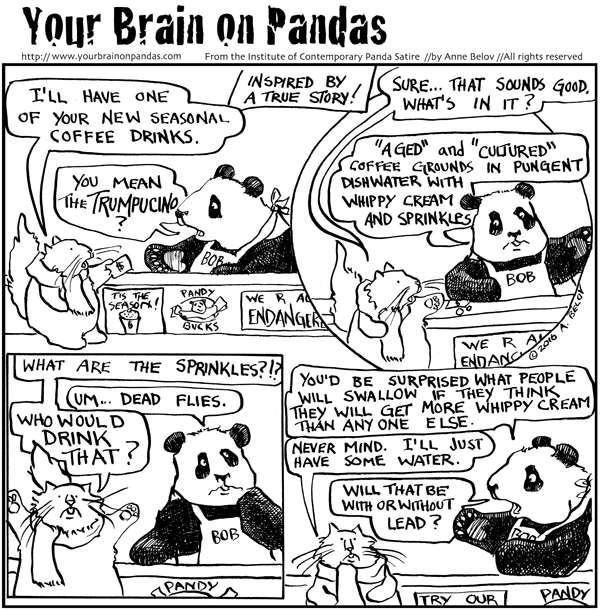 I started my blog (The Panda Chronicles) to share my panda cartoons with a wider audience than whoever I could catch unawares in the produce aisles of Payless, waving a stack of cartoons in the air. I joined Facebook to see if people who didn’t know me would think they were funny. I went to my first Panda Convention in 2013. Some of the people coming were familiar with my cartoons. You can pretend to be anyone you want when you are hiding behind your computer. It’s another story when you step through the looking glass into the real world. But here’s the thing: when you share a common interest, social media is like this amazing coffee shop, where everyone is table hopping and you can meet some fabulous people there. Okay, yeah, there are some dark corner tables way in the back, where there are some people you would rather not meet alone in a dark alley, but for the most part, the people I have met as a result of jumping into the social media pool are pretty wonderful, in person as well as online. It’s not just the panda people either. (Attack of the Panda People sounds like a sci-fi movie, doesn’t it?) I belong to an organization for writers and illustrators of books for children: SCBWI. While I initially met many people IRL (in real life) at one of their conferences, I’ve gotten to know far more writers from this group online. Some of the folks in one of my groups have made an effort to meet in person, and the other writers in the mentorship program I took part in last year keep in touch through email, Twitter, and Facebook. There seems to be a fluidity to these on- and offline friendships. They are no less real than the ones that happen because you sat next to someone in sixth grade, or because you had a random stranger as a roommate at college. It’s the accidental nature of the universe that brings forth surprising gifts. Earlier this year, I did a fundraising campaign for several of my favorite causes. Those who donated got a signed cartoon, with a hand-drawn sketch in thanks. Some who donated were familiar names, but more than half of the people who contributed were people I had never interacted with. Some of them had been reading my cartoons for years and had all my books! It was gratifying, to say the least. An online friend from Australia is going to visit me IRL this summer. And a group of friends I have made as a result of going to that first Panda Convention? We’re going to China later this year to visit the panda bases (aka panda ranches), where we will see herds of baby pandas! If that doesn’t qualify as being amazing, I don’t know what does! 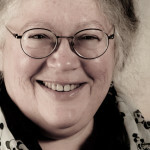 Anne Belov lives and works on Whidbey Island, in an undisclosed location. Her paintings can be seen at The Rob Schouten Gallery in Langley (starting in May) and at The Fountainhead Gallery on Queen Anne Hill in Seattle. You can find her peculiarly political panda satire at Your Brain on Pandas, and her books at Moonraker Books in Langley or on Amazon. Feel free to follow on Twitter where she is @pandachronicle and visit The Institute for Contemporary Panda Satire on Facebook. 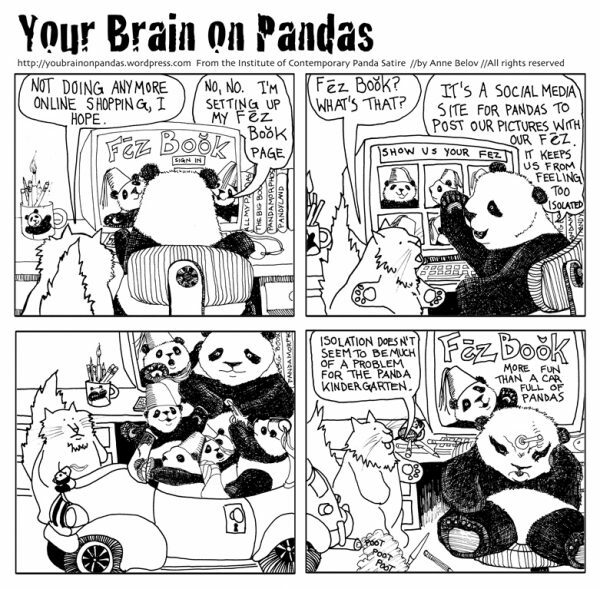 Her latest collection of panda satire is The Panda Chronicles Book 7: Don’t Call Mee Boo Boo has just been released! Thank you. I definitely don’t see you often enough! We need to fix that. Great post Anne. Who knew?!?! I know! right? Who knew indeed! This is so amazing! I can’t wait to hear about your visit to Panda Ranch(es)! I loved seeing panda cartoons being waved at me between bites of cheese and laughter. I love more seeing your books grace my bookshelf. You’re awesomesauce! Thank you SO much for sharing your amazing journey! I can hardly wait either! I think this trip will have creative repercussions extending into the fine art realm as well, but there will definitely be some sort of visual chronicling of this trip. Lovely article Anne. And I was so very excited to meet you in person at the convention a couple (or three) years ago. I’m sorry I couldn’t make it to Atlanta this year but hope to see you again one day. Your books and writings bring a smile to so many of us on a daily basis. Thank you – thank you – thank you. As they say, Next year in San Diego! The Wu self was disappointed we all decamped to Atlanta, but the twins!!!! You are one of the people I think of, when I think about all the wonderful panda fans I have gotten to meet in person. Woo hoo! 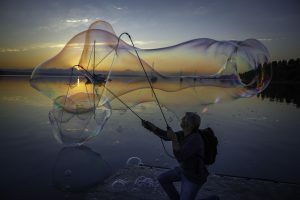 Dis is sooo cool, great blog! But of course any good news about Pandas and Panda people is wonderful! Tink me can stowaway to da Panda Ranch? Me want to visit my bestest bear buddy – Pinky! We are going to be visiting the panda ranch that Pinky is now at. We can only hope she will stay at the same location. It looks like she is adjusting well, and the eye witness reports from her Aunty Charlene did much to ease my anxiety. Lately, I’ve been thinking that there is a cartoon story line involved in her trip to China. Stay tuned.